It doesn’t need to be a Tuesday to enjoy the delights of a Taco Tuesday! 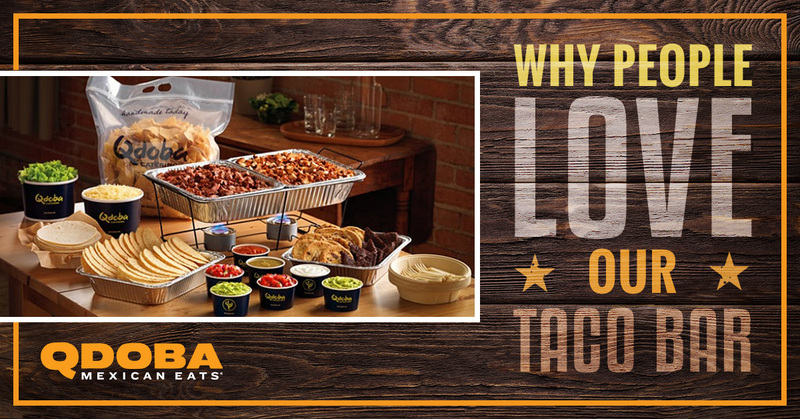 Any day will do when it comes to having Qdoba catering provide a delicious taco bar for your next party or corporate event. The important things are that the food tastes great, is healthy, and provides a bonding experience for the diners. Qdoba catering has just the thing. We deliver the food and set it all up at your request. Our Taco Bar will bring out the kid in your guests and employees. Your guests will have a choice of marinated grilled chicken or marinated grilled steak to satisfy their cravings for meat. For vegetarians, there is the combination of beans and rice to make your full protein. You can choose between soft flour or hard corn taco shells, between chicken, steak, and beans, and of course how you top off your taco is all up to you! Try multiple combinations to satisfy your taco cravings. When Qdoba caters your event with a Hot Taco Bar, you also get a dessert of delicious fudgy double chocolate brownies or chocolate chip cookies. Additionally, you can choose to get drinks too. We offer Bulk Iced Tea and Bulk Lemonade to wash down your scrumptious tacos. The next time you need to feed the whole tribe and satisfy everyone’s hunger with food that gives people a chance to talk and relax, choose Qdoba Catering’s Hot Taco Bar. Call today and order your Hot Taco Bar!